Following a 33 year career in newspaper journalism Dave did a short stint driving the California, Nevada, Arizona fleet for Gordon Trucking, Inc. 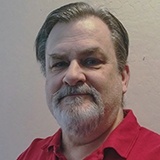 He now resides in sunny Arizona but keeps busy with writing and editing trucking-related articles. Now, into its second year of full mandatory use, there are concerns in the industry that not only have ELDs not reduced accidents, but that the devices are causing some to question whether the wall of separation between independent contractor and employee status is disappearing. Truck drivers arriving at a distribution center in the very near future could be greeted by the sight of yard trucks running around the facility as usual -- hooking, unhooking, pulling trailers and hitting docks – but with one major difference … all that without a human being behind the wheel. A number of trucking companies lately are reaping the financial benefits of putting their drivers up in hotels overnight rather than having them spend the night in sleeper cabs. With electronic logging devices now mandatory and enforced, and with more than half of American trucking companies in its customer base, a relatively new technology company called KeepTruckin is now entering the load board field with a new app called Smart Load Board. Trucking companies and U.S. manufacturers breathed a collective sign of relief late last week when President Trump backed off from his threat of closing the southern border. But problems still remain for cross-border truckers as they face increasingly longer lines and wait times to get across. In this Friday Short Haul we discuss how state laws concerning marijuana affect truck drivers, learn about a new ATA campaign against crumbling road infrastructure, and hear FMCSA explain personal conveyance rules. Fuel pump scammers are busy, but there are ways to avoid being a victim of card-skimmers. In this Friday Short Haul we look at the new semi-autonomous Freightliner Cascadias, see the results of a motorist survey about truckers, learn about a U.S. Xpress award, and view the rollout of new technology that helps drivers find parking spots. The "It's a convoy!" of lore and ballad is morphing into an entirely new concept for truck transportation on America's highways. But, it's doubtful that movies and songs will spring forth in honor of what motorists may soon be encountering along this country's interstates. In this week's Friday Short Haul we announce the WIT survey, learn why a motorist is irate at truckers, report FMCSA's easing of HOS for flood states, and announce a new ball cap for truckers. Distraction is the nemesis of anyone trying to observe safe driving practices. We all know that. Cellphones, GPSs, ELDs, lane-change warnings, etc., all contribute to taking away a truck driver's attention while on the road. But what many don't realize is that the problem goes much deeper than being distracted by gadgets and such. There is actually a science behind this, and it has a name – inattentional blindness. A spate of fake accident claims against commercial vehicles in the New Orleans area highlights a growing problem for trucking companies. In the Friday Short Haul for March 8 we see the results of failure to sweep snow off the roof, catch truckers bypassing a new toll road, and see what NYPD is up to concerning Google's Waze app. At what point is the American public going to stand up and take notice of the truck driver shortage? According to spokespeople for the retail industry, that time is right about now. In this Friday Short Haul we look at possible changes in the way freight rates are calculated, find out about new HOS rules possibly coming soon, and get January's tonnage report. Fleet drivers, like a lot of other company workers who have un-reimbursed expenses, and whose income is reported on a W-2, can no longer deduct their daily expenses of meals, cell-phones or other common expenses used in doing their jobs that were deductible until this year's new tax laws went into effect; which results in decreased refunds this year. Late last year the FMCSA announced their Under 21 Military CDL Pilot Program, allowing carriers to put drivers under 21 to work driving outside of their home states. In this Friday Short Haul we see why Connecticut trucking companies are riled, we look at what's happening with hydrogen fuel-cell trucks, and discover the roads with the worst cell phone use. That America's roadways are a deteriorating mess is no surprise to anybody who has sat behind a wheel any time recently. But the problems of our nation's crumbling infrastructure go far beyond just the discomfort of a jarring ride. Simply put, our country's economic health demands that our roads get an upgrade. In a report recently released by SensiGuard Supply Chain Intelligence Center the number of cargo thefts were down by 19 percent across the United States last year, but the value of goods stolen is about the same. Since 1997, the TCA Highway Angels program has honored hundreds of professional drivers -- several every month -- for "the exemplary courtesy and courage they have shown others while on North America’s roadways." They announce the Feb. 1 honorees. Is a guaranteed minimum pay the solution to the driver shortage? In the ongoing effort to alleviate the driver shortage trucking companies are beginning to consider a new strategy to entice new drivers – they are taking a hard look at their reasoning behind sign-on bonuses. They are asking whether they should ditch them entirely in favor of offering guaranteed pay. In this Friday Short Haul we discuss Walmart's hiring and salaries, Uber's new Facilities Ratings app, a proposed speed-limiter law, and introduce members of this year's America's Road Team. A researcher with the Washington State Department of Labor and Industries teamed up with researchers from North Carolina State University to put to the test something that most truck drivers do every day … sometimes several times a day. Their goal was to find out what is the safest, least injurious way to crank the landing gear on a trailer. In today's "Friday Short Haul" of news we discuss highway robbery in Mexico, will autonomous trucks replace drivers, and fleets of new trailers coming soon. Despite an economic decline in some sectors in 2018, particularly in December, the transportation industry continues to show economic expansion.